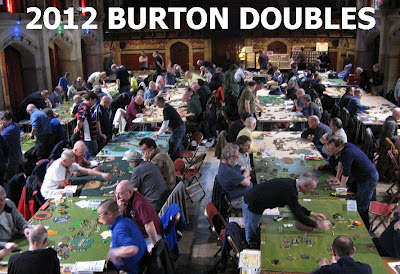 The second of the year's big doubles events comes round quickly after Usk at Burton on Trent, the home of the brewing industry. 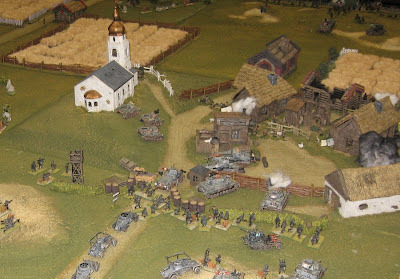 I always make sure I have a pint at lunchtime. Traditionally Burton followed the four DBM books of Army Lists in rotation, and this would have been the first of the four books - Biblical (and my favourite next to Book 4 - Medieval*). 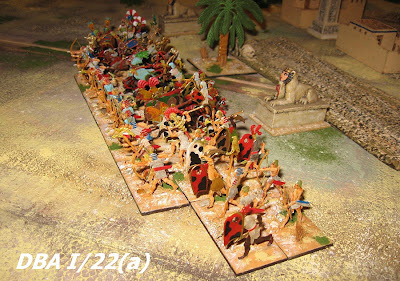 I'm not sure it's quite fair to put men in loincloths with bronze weapons up against Phalanxes and Legions, really - and judging by the popularity of Graeco Bactrian and Seleucid armies, many players agree (rules aren't always at the fairest when the spread over technological watersheds like the end of the Bronze Age ...)..
We chose to go with a traditional Biblical army ... 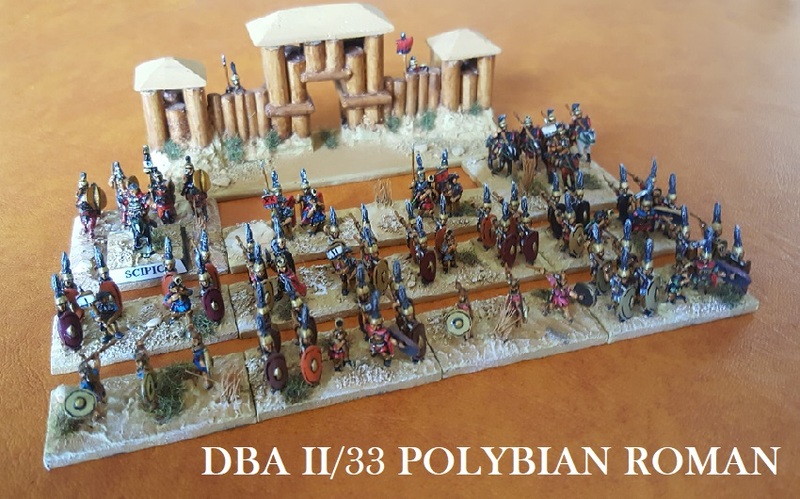 Early Libyan (a great fun, massive army in the hey-day of DBM ... but out of favour since the V3.1 changes made Wb(F) armies almost hopeless). 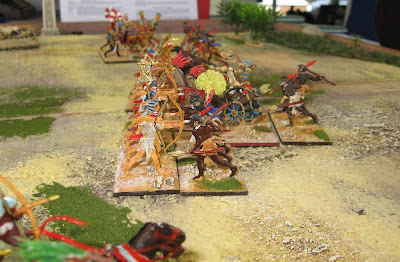 The main thing to say is that the event gave us four really enjoyable and nicely fought games. 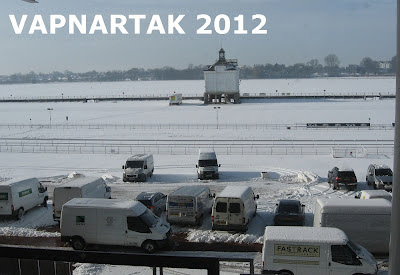 Sometimes you will read chuntering about 'competition wargaming' - nearly all of it written by ill-informed pundits who think they know better but don't actually play (or who maybe lost a game thirty years ago and haven't gotten over it somehow): they should get off their high horses and play doubles at Usk or Burton. 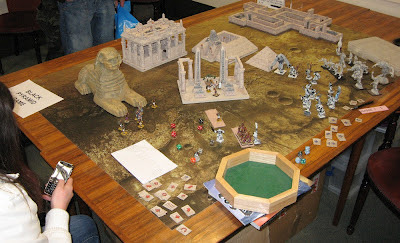 They might enjoy it. 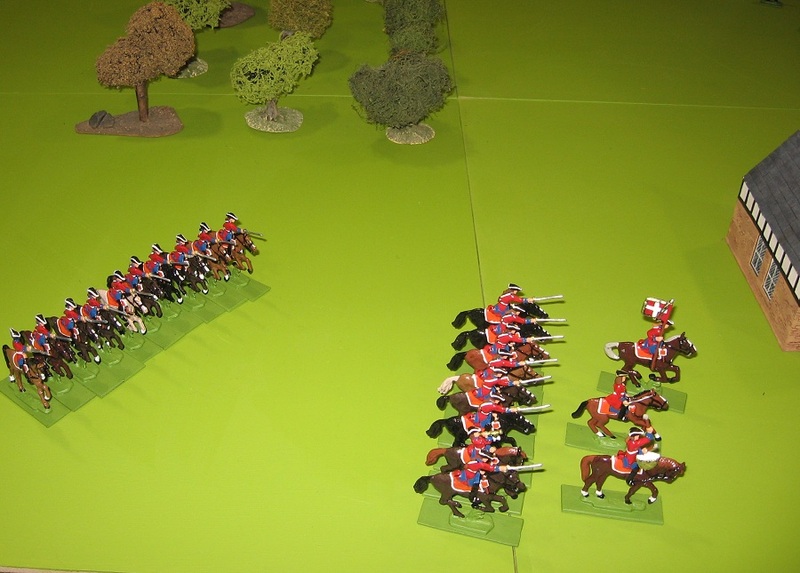 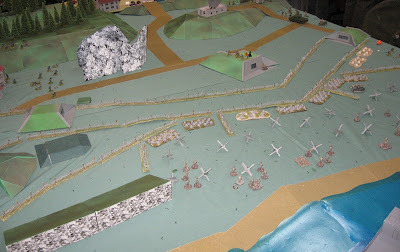 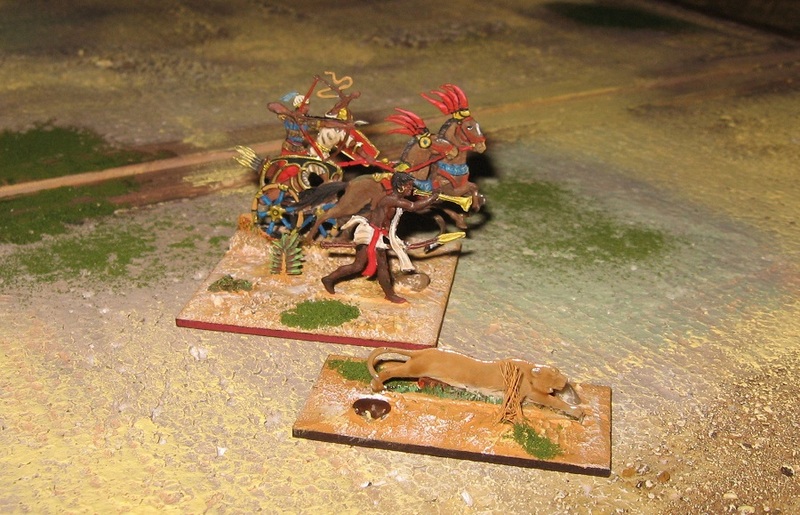 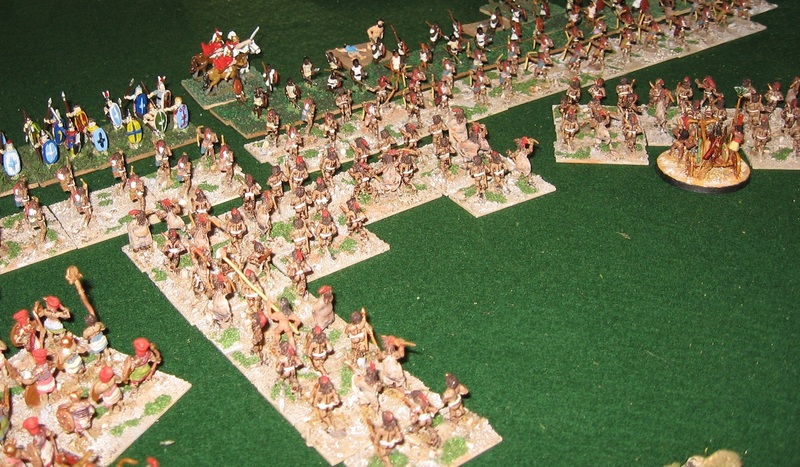 In the end our games were decided by the skirmish and the charge of our warriors. 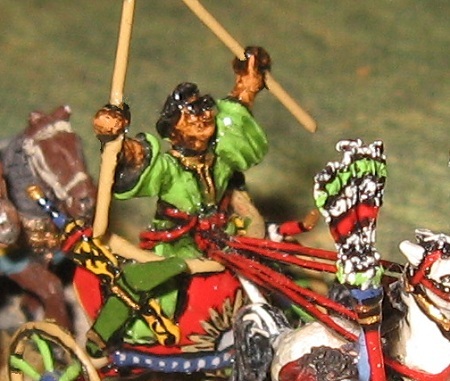 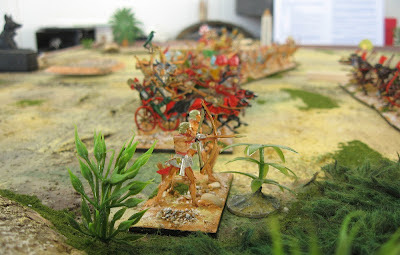 If we could destroy the enemy front lines with our bowmen, we might be in business. In FoG the warriors are unprotected (Medium) Impact Foot. Against armoured guys that gives us one real shot - the Impact Phase. 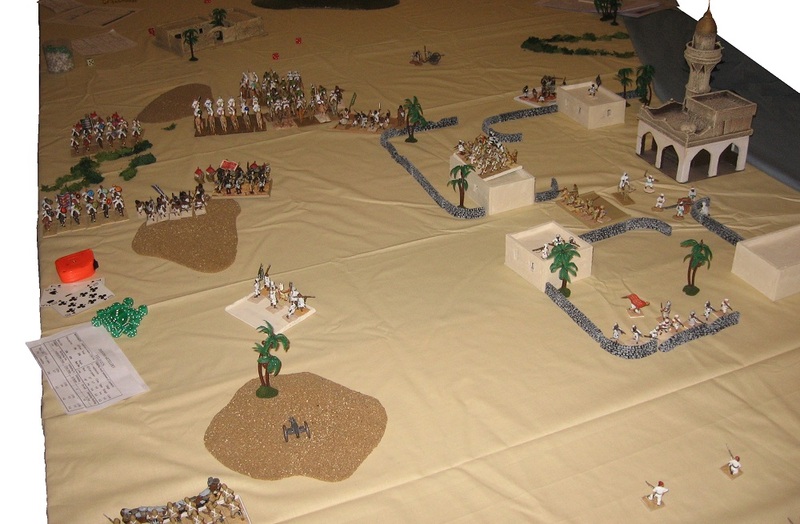 If, as in our big win, we can disrupt the enemy with the charge, we can make headway in the game. 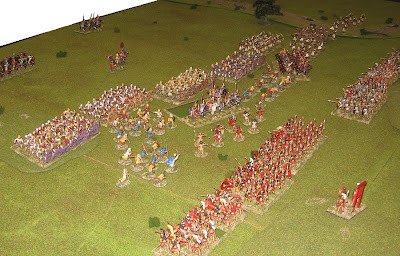 If, as in most of the games, the enemy can stand the impact of the charge, the warriors will likely be cut to pieces in the melee. 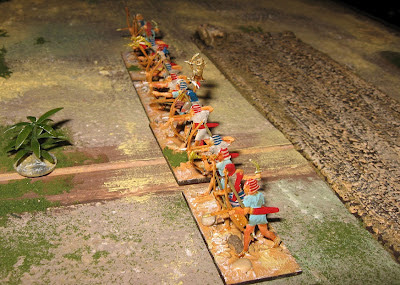 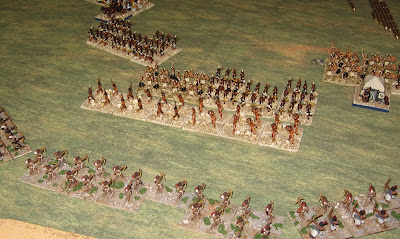 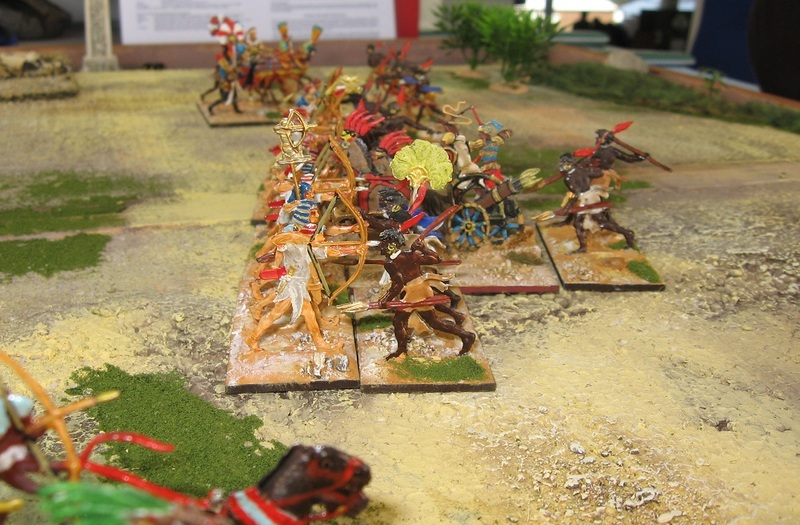 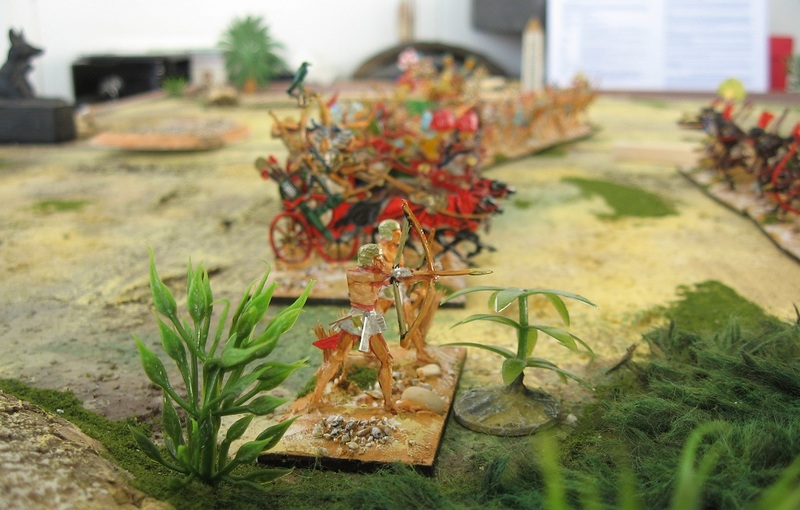 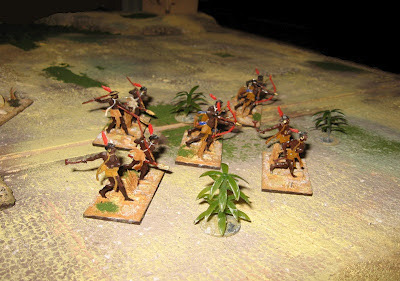 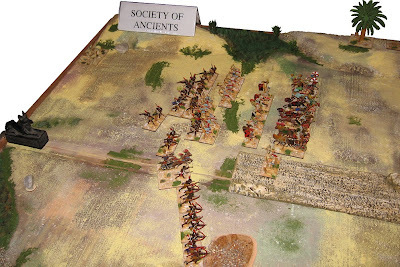 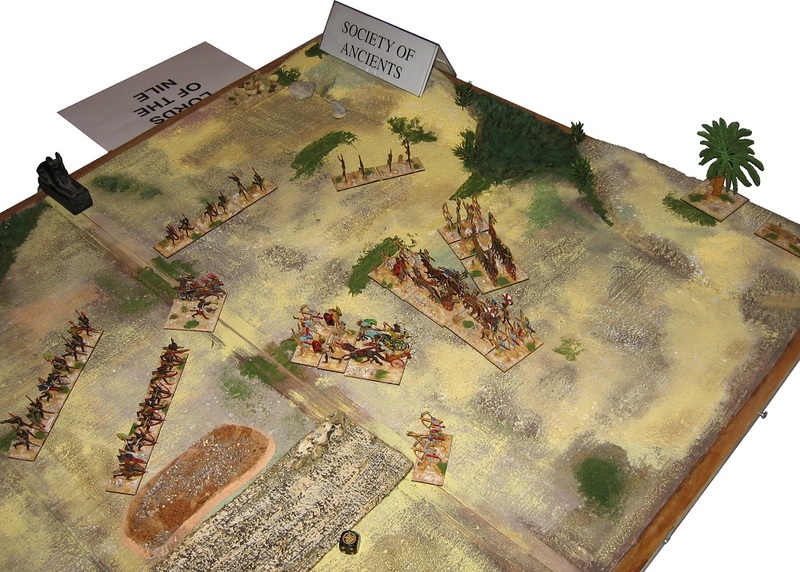 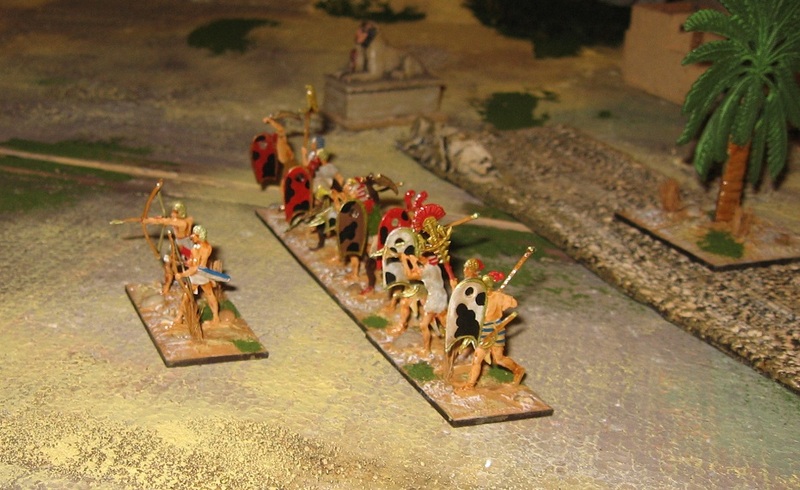 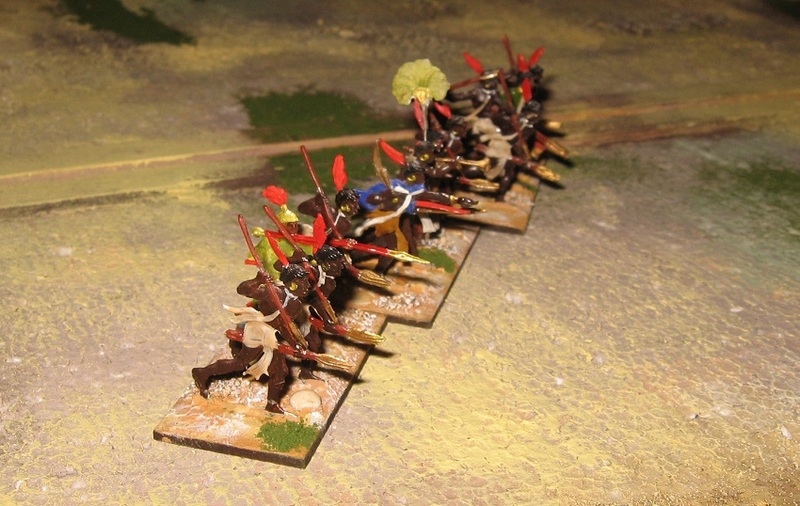 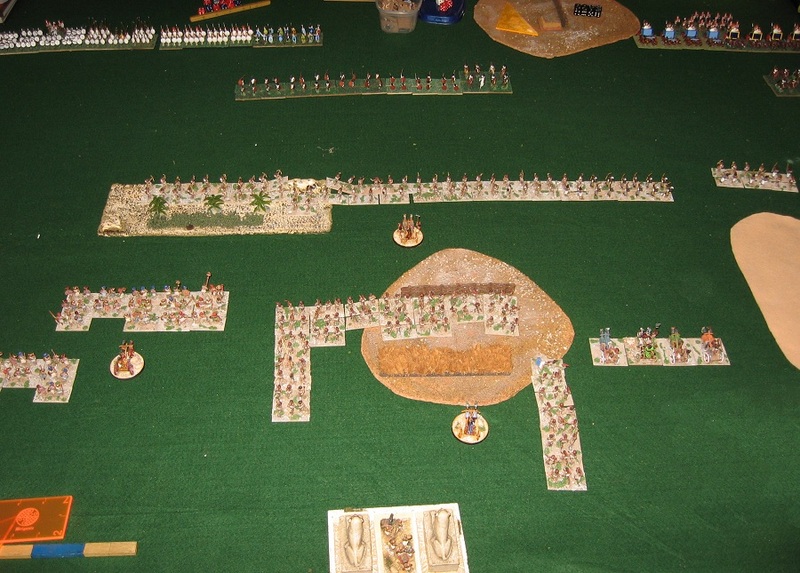 The light chariots proved really useful and durable, but were mostly outnumbered, the skirmishing bowmen were always a threat ... but we had centred the army around the warriors and the (slightly better armoured) Sea Peoples allies. 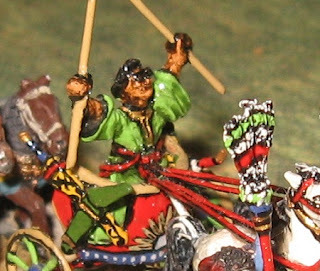 In the end, there just never seemed to be enough of them to compensate for their weakness in the protracted melee phases of combat. 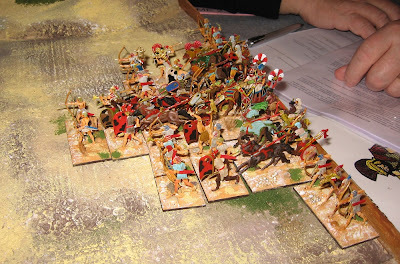 Ignoring the last game against Parthians, which was really a long and exciting skirmish encounter**, we got three goes at infantry based armies (Carthagnian, Mycenean and Later Dynastic - i.e. mostly mercenary Hoplite - Egyptian) winning one handsomely, otherwise just running out of troops to support the front lines. 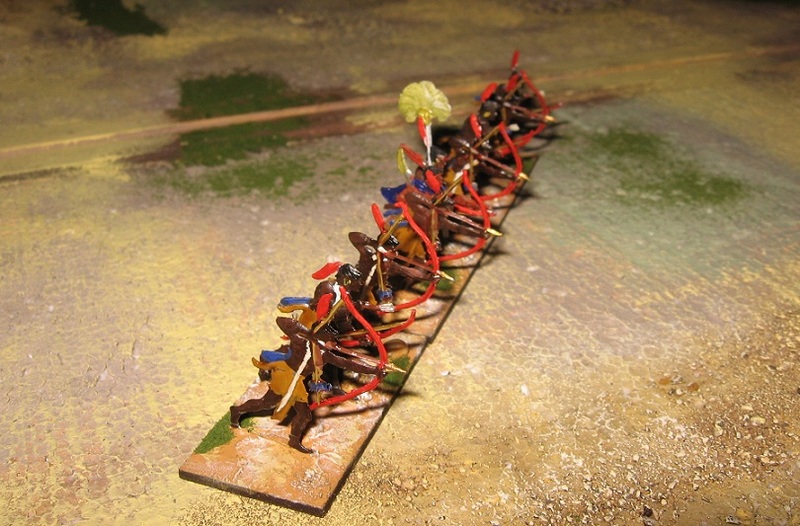 The points system just doesn't give you the second wave you need to have a real chance of breaking armoured infantry. 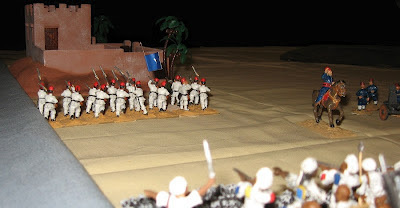 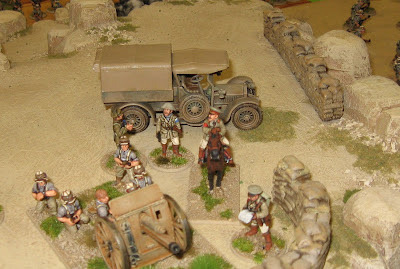 (eager to seem sophisticated, the Libyans made their encampment amongst the Sphynxes of the detested Egyptians ...)..
Full results are available (say, TMP ), but an enjoyable weekend, great cameraderie and plenty of fun with an army that can lose with its heads held high ... Thanks again Burton. 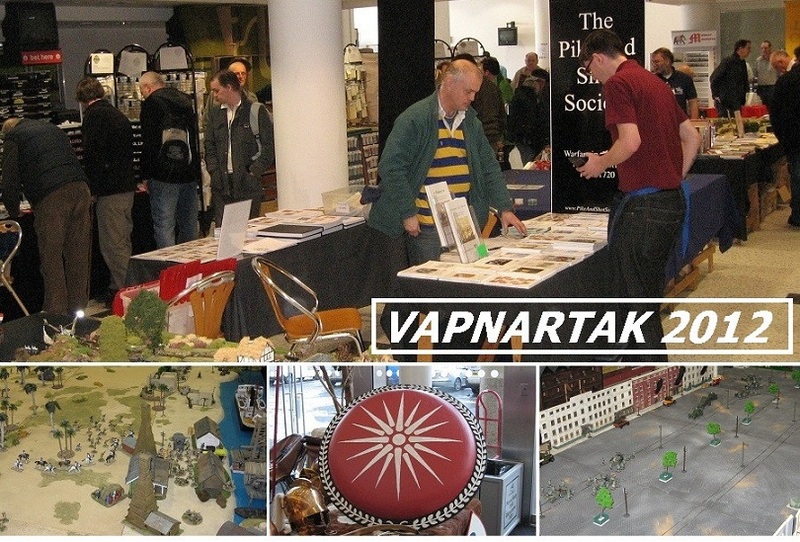 *this is not a slight against the Classical period for interest ... the age of the Greeks and the Romans is at the heart of 'ancient' wargaming - just I have never felt the warfare of the period is done well by the popular tabletop rules (where pike blocks tend to swirl around like Napoleonic battalions - who themselves didn't really swirl around anyway - rather than hold long steady frontages as they did historically). So it's a game thing. 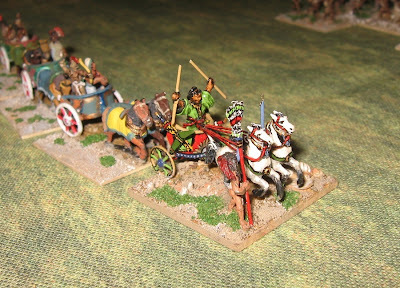 ** our naked Warriors were never going to charge headlong at Cataphracts, but the metal men were always going to be too slow to bundle through and chase us down. They constitute the first delivery phase of my refurbishment of the flats collection I acquired at Fiasco last year. 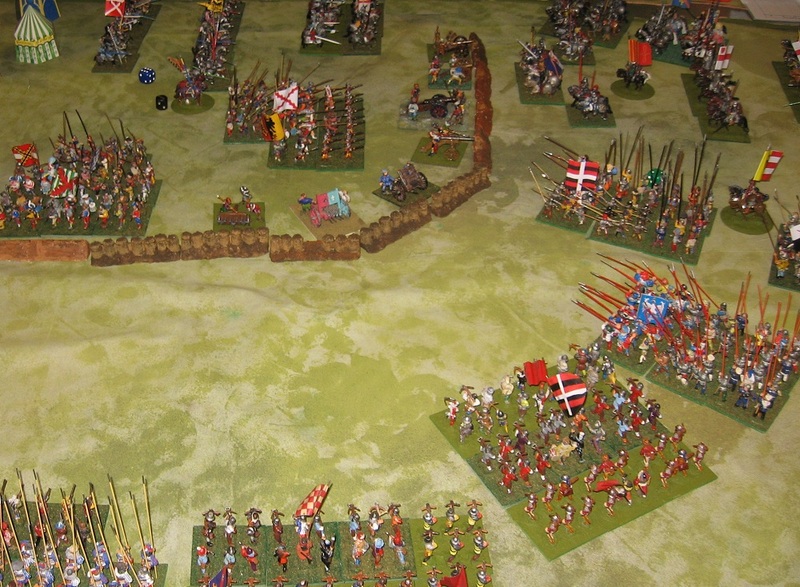 The presentation is to what I would call 'wargames standard' rather than flats collector standard: (a) I'm working with an existing collection, rather than painting from scratch; (b) a few experiments revealed that the aesthetics differ between figures destined to be viewed flat and individually and those destined to be viewed en-masse on multiple bases. 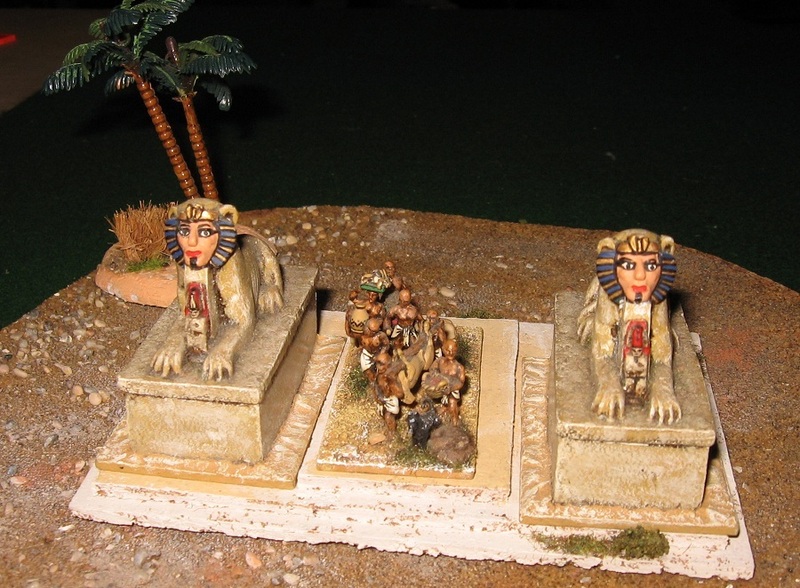 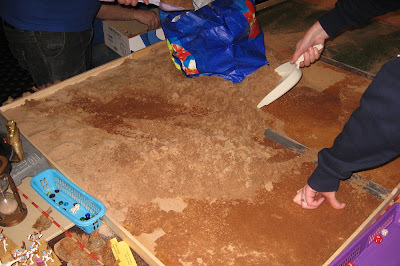 The basing is in the modern landscaped idiom (and to standard 25/28mm base sizes). 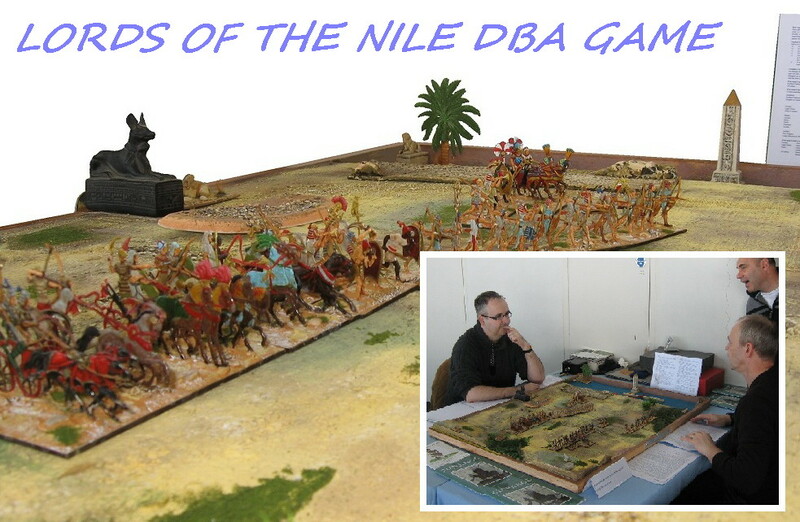 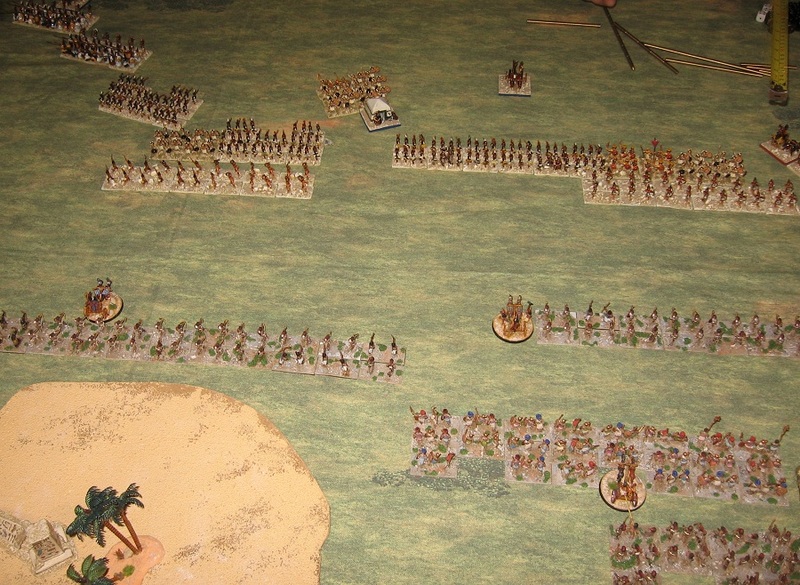 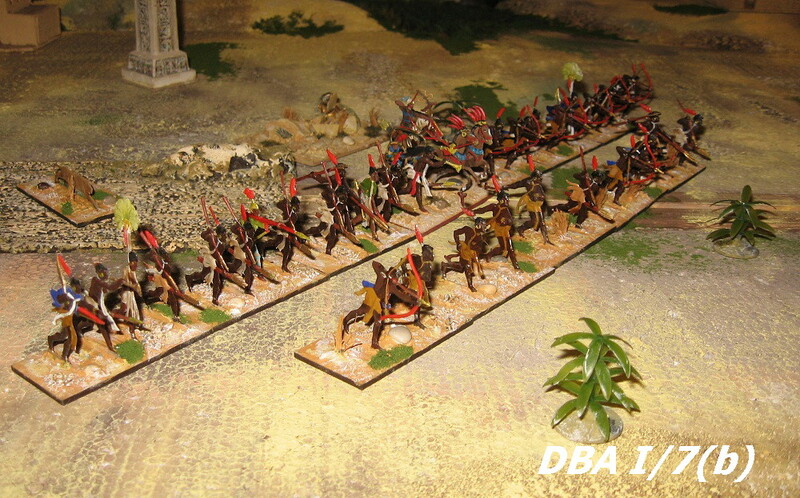 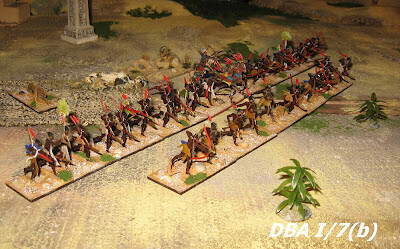 The lead army is New Kingdom Egyptian, which I have cast on a punitive mission on the banks of the Nile. Their enemies I have styled 'Rebellious Tribes' as although the figures are mostly Nubian, I have chosen to organise the army using the Libyan list. 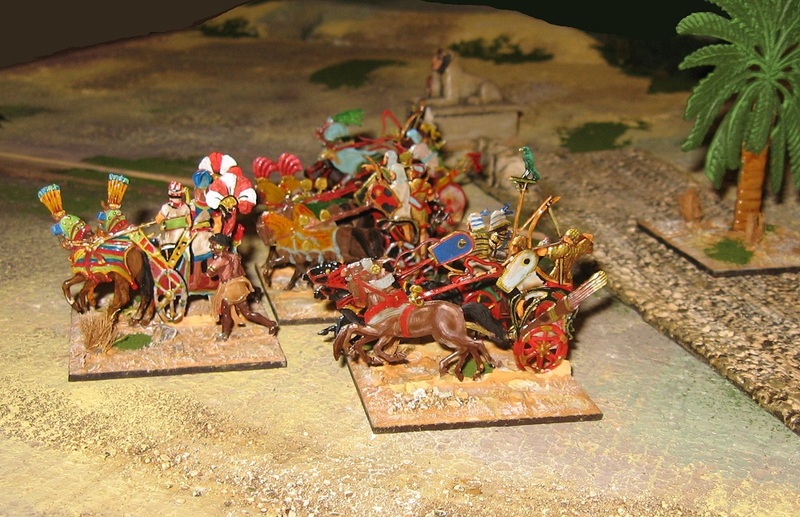 The rationale is simple enough: using the Libyan list gives the rebels a chariot general! 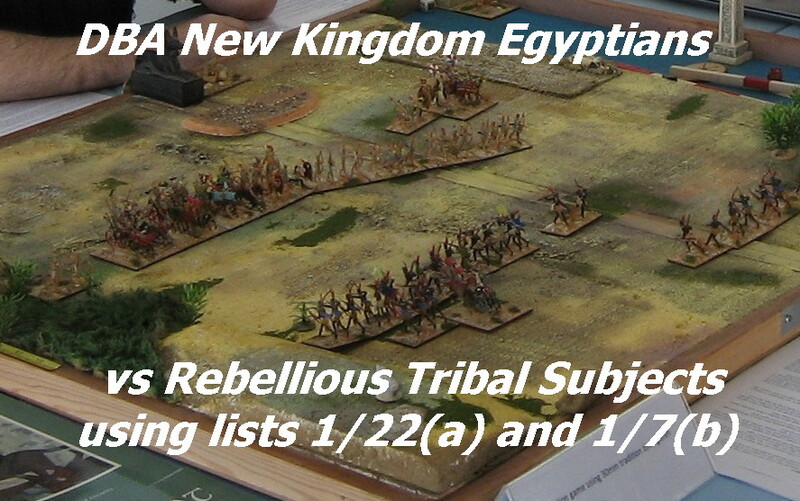 Otherwise there is little difference between the Libyan and Nubian lists. The armies follow the existing DBA V2.2 lists, although the games have been played using the latest trial version of V3. Victories have been even between the armies.